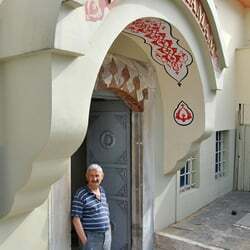 Büyük Hamam is a Turkish bath in the Iplik Bazar–Korkut Effendi quarter of North Nicosia. It stands close to the İplik Pazarı Mosque. As a result of the rise of the ground of the surrounding areas over time, its door is now located around 2 meters below the ground level, and the bath rooms are 3 meters below.